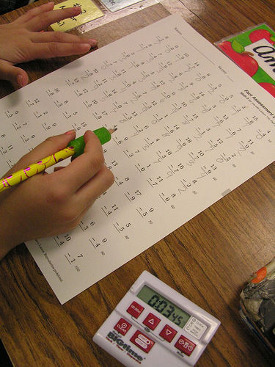 Timed tests for math facts have become very popular in the US. Teachers use them to check if students can quickly recall math facts (automaticity). They promote and single-handedly CAUSE math anxiety. That doesn't come as a surprise. Researchers have found that when people are stressed, it simply BLOCKS their working memory. I'm sure all of us have had the feeling of "mind going blank" when feeling nervous. It's a true process happening in the brain, and it prevents students from recalling math facts in tests though they know them! Timed tests cause children to be afraid of making mistakes. The problem with this is that then children will not understand nor experience the BENEFICIAL role mistakes have in learning. If students are afraid of mistakes, then they're afraid of trying something new, of being creative, of thinking in a different way. They're scared to raise their hands when they don't know the answer, and their response to a difficult problem is to ask the teacher rather than try different solutions that might – gasp be – wrong. They are, as one teacher told me, victims of excellence. I have written a separate article about the value of mistakes in learning. Our brain literally grows and makes new connections between synapses while we think about the errors we've made. If children are only given "easy" routine problems – OR if they are afraid of working on difficult problems because of fear of making mistakes, they cannot grow their brains! Timed tests convey a message that success in math is about "performance," which is very misleading. We need to see mathematics as a subject that allows creativity (many different solution paths) and is beautiful & fascinating. "I was always deeply uncertain about my own intellectual capacity. I thought I was unintelligent. And it's true that I was, and I still am, rather slow. I need time to seize things, because I always need to understand them fully. Even when I was the first to answer the teacher's questions, I knew it was because they happened to be questions to which I already knew the answer. But if a new question arose, usually students who read as good as I was answered before me, and towards the end of the 11th grade I secretly thought of myself as stupid and I worried about this for a long time. I never talked about this to anyone but I always felt convinced that my imposture would someday be revealed. The whole world and myself would see that what looked like intelligence was really just an illusion. Now that never happened. Apparently no one ever noticed it, and I'm still just as slow. At the end of the eleventh grade, I took the measure of the situation and came to the conclusion that rapidity doesn't have a precise relationship to intelligence. What is important is to deeply understand things and their relations to each other. This is where intelligence lies. The fact of being quick or slow isn't really relevant. Naturally, it's helpful to be quick, like it is to have a good memory. But it's neither necessary nor sufficient for intellectual success." Now, all that said, there are some children who enjoy timed drills. For example, some students enjoy racing against the clock in a computer game while practicing the multiplication tables. However, even with these children, monitor how they are doing and stop the timing if you notice any negative signs in connection with the drills. A teacher can also do a "timed" drill without a clock. State a math problem orally, and simply count to five quietly in your mind while waiting for the student(s) to write or say the answer. Don't let the student(s) know they're "timed", which should prevent most of the anxiety. How can we teach math facts then? There are better methods of teaching a quick recall of math facts that ALSO give students conceptual understanding and help them develop number sense. 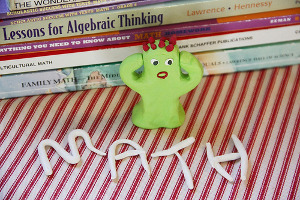 Number sense is critical: research has found that it is what separates high achievers from low achievers in math. To develop number sense beyond the basic facts, you can use so-called number talks — short discussions among a teacher and students about how to solve a particular mental math problem. The focus is not on the correct answer, but on all the possible methods of finding the answer. What's Math Got to Do with It? : How Parents and Teachers Can Help Children Learn to Love Their Least Favorite Subject by Jo Boaler. You can "look inside" this book at Amazon.